Have yourself a merry little mod Kitschmas. The 2018 Christmas home tour continues into my newly updated groovy 60’s inspired living room. It all started with a floral couch at Salvation Army and I redecorated the entire room around it. 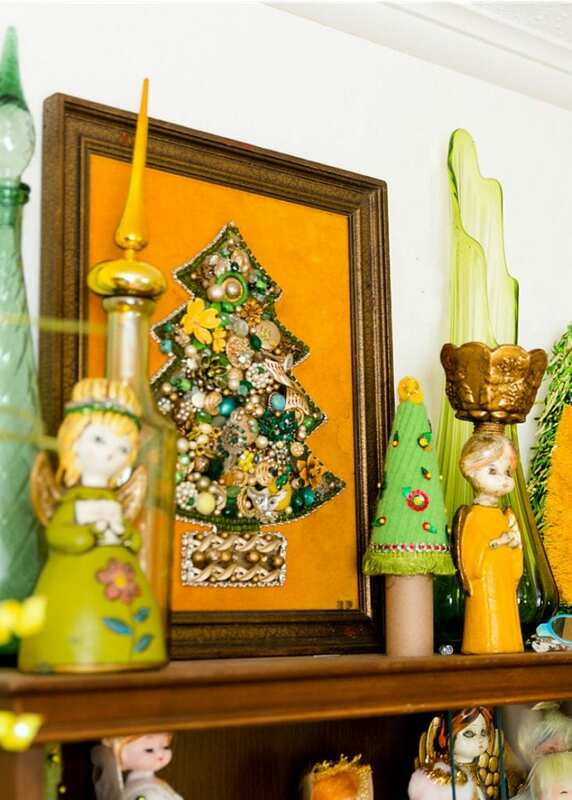 Yellow Christmas trees and a vintage angel collection were the only way to go. 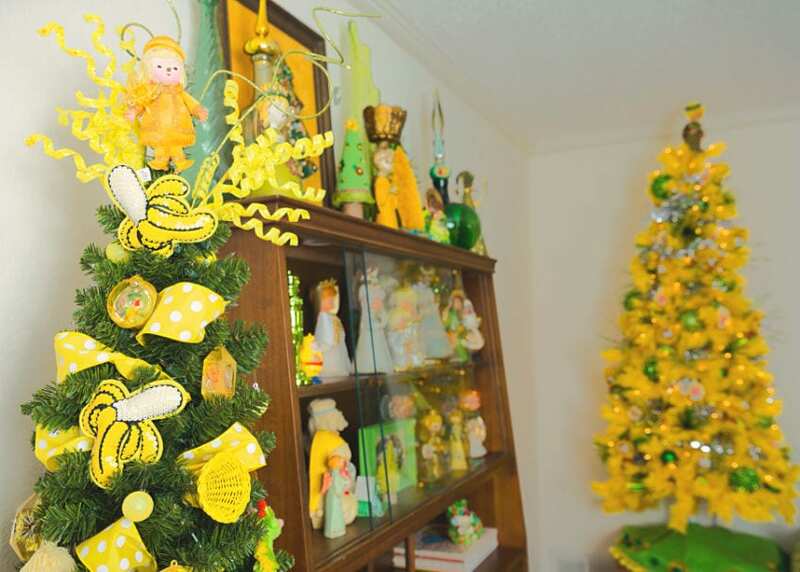 I never knew I could have these kinds of strong feelings for a yellow Christmas tree, but don’t tell the rest of my Kitschmas forest, these yellow trees might be my favorites. I mean come on how perfect are they on either side of my new vintage floral sofa? Pretty stinking’ perfect! I didn’t want to go overkill on the ornaments just a few pops of green! Can we also take a minute to talk about the vintage NOEL sign I snagged at a flea market this year. There are pockets that hold Christmas cards. I know a thing or two about DIY tree skirts. I have a serious aversion to naked tree stands showing so me and my trusty hot glue gun got busy embellishing a readymade Christmas tree skirt with pompom trim and plastic raffia loom flowers. Not all my Christmas trees are wacky colors like yellow. Did you see my post on all the Artificial Green Trees I’ve Known and Loved? No self respecting kitschmas lovers collection is complete until they have a few vintage Christmas jewelry trees to call their own. 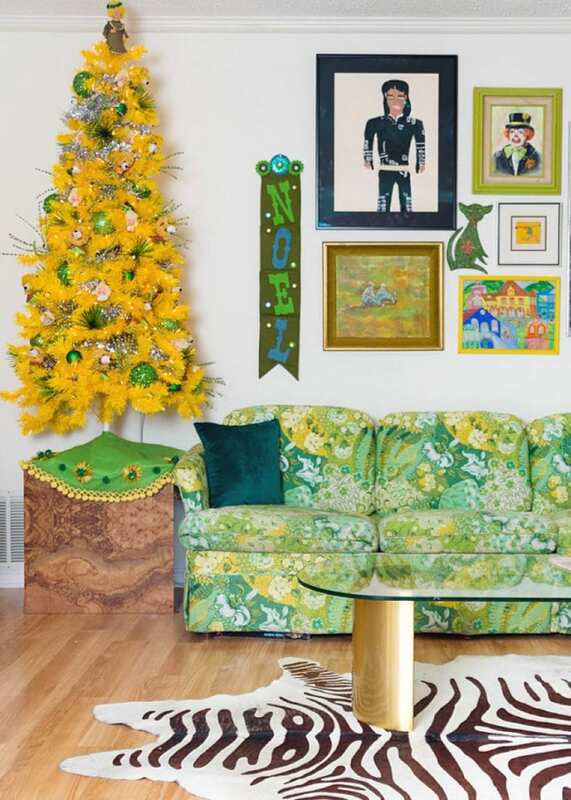 This green and gold beauty was destined to live in this room. 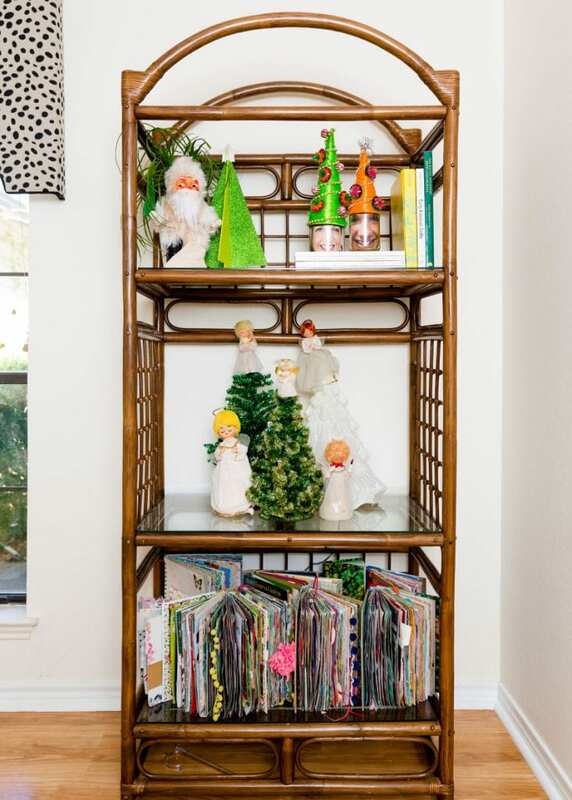 Check out these 10 Christmas Crafts to give Your Decor a Vintage Vibe over on DIY Network to see my full collection of jewel trees. 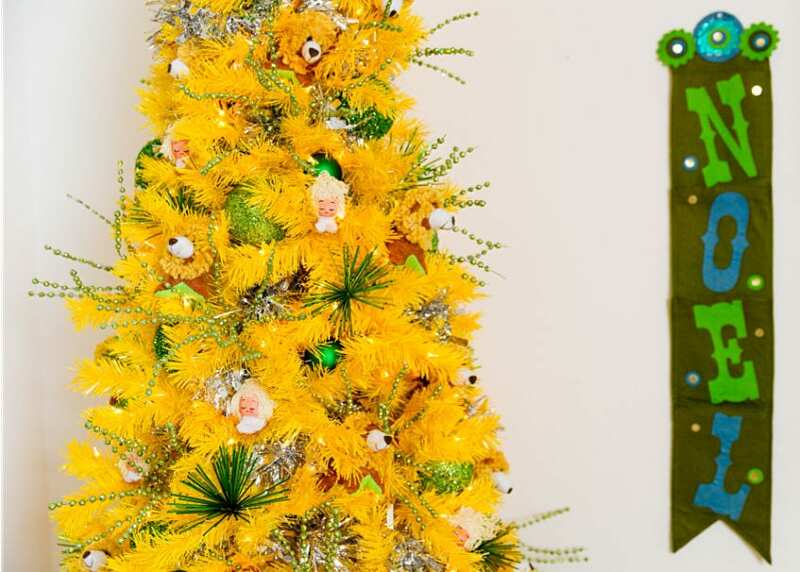 Oh and try making your own Recycled Sweater Christmas Trees too! I like to mix my decades when it comes to Christmas. 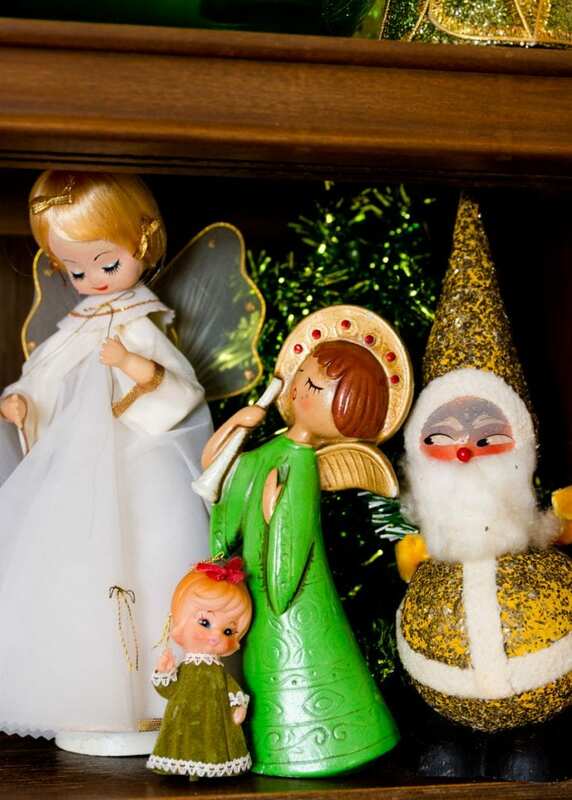 Antique German Santa dolls giving the side eye live side by side with swinging 60’s angel tree toppers. 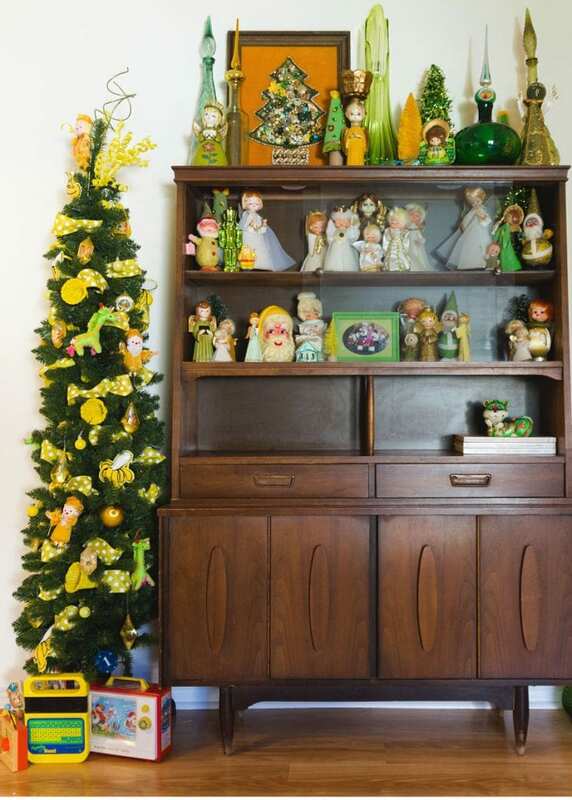 As long as it is green, yellow or white and covered in kitschmas goodness it found it’s way into or on this vintage mid-century wooden cabinet. P.S. Also, when you can’t find the right tree skirt try adding a collection of vintage toys instead! I love Target ornaments as much as the next guy. Did you really think I was going to leave these sequined bananas behind? 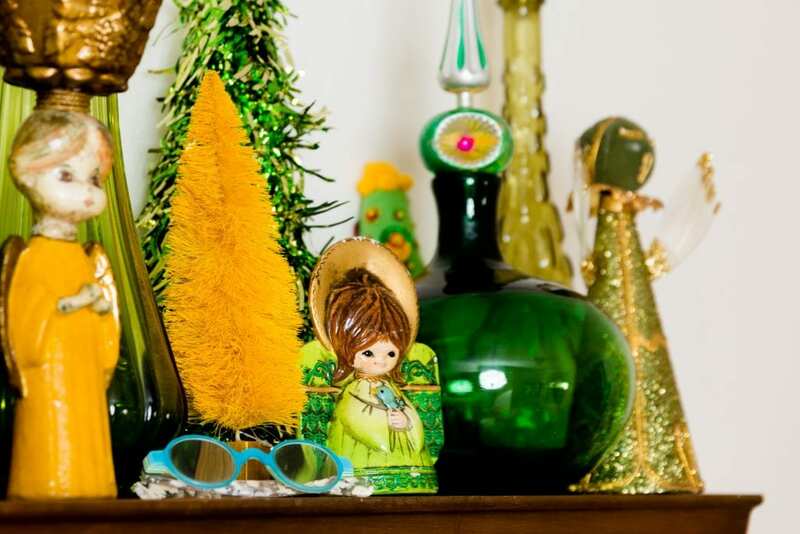 The key is to mix them with vintage ornaments so no tree is big box head to toe. I have a LOT of holiday collections and vintage angel tree toppers happen to be one of them. 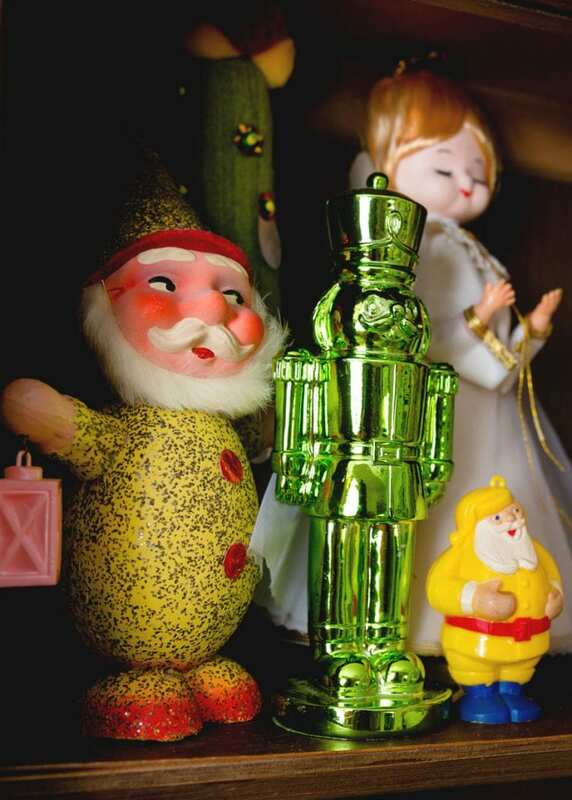 I’m especially fond of the paper mache and ceramic angels in non-traditional colors like green. I’ve got plenty in white, but the ones in colorful robes steal my heart. Love these Christmas Beehive Portraits? 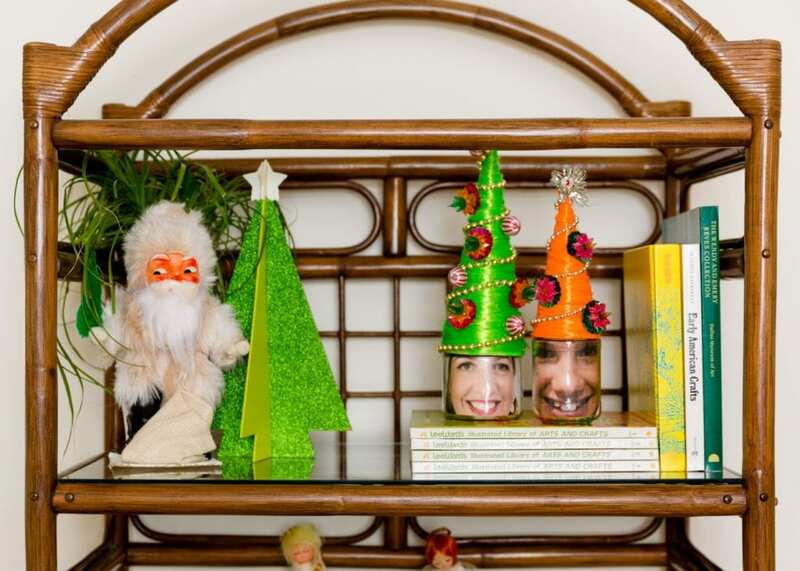 Check out my Wildly Technicolor Tabletop Christmas Trees over on DIY Network. Are you guys enjoying this home tour series as much as I am enjoying sharing it! I hope so. Posted December 3, 2018 & filed under Christmas, Holidays. 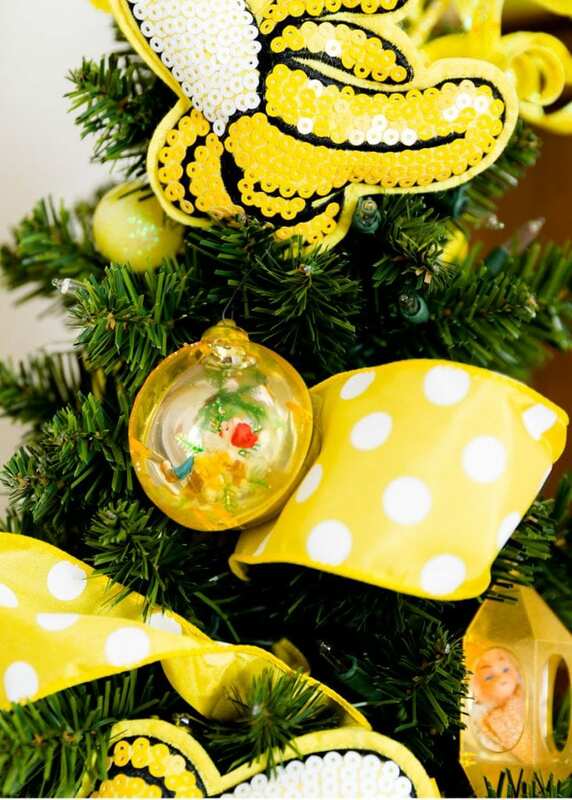 as always, totally here for everything you do – including a green and yellow Christmas! Love your angel collection. 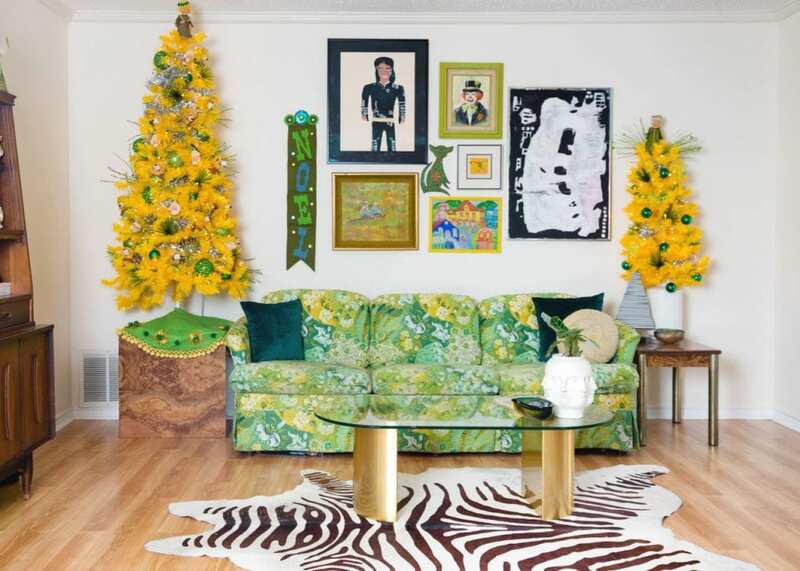 The yellow trees are indeed perfect on either side of your fun 60’s sofa! Love how fun this Christmas living room is! It’s a Feature pick for the next Merry Monday party. See ya there! Merry Christmas! I’m happy to see that you dare to be different. Love the bold colors!